British synth-pop band founded in 1978, before splitting in 1996. They reformed in 2006. 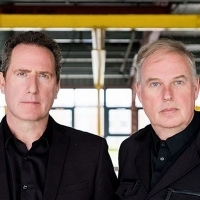 Founder and current members include Andy McCluskey - vocals, bass guitar and keyboards, Paul Humphreys - vocals and keyboards, Malcolm Holmes - drums and Martin Cooper - keyboards and saxophone. Key albums have included their 1980 self-titled debut (with "Electricity" and "Messages"), "Organisation" (with the hit "Enola Gay"), "Architecture & Morality" (with hits "Souvenir" and "Joan of Arc") and "Dazzle Ships" (with "Genetic Engineering"). Other hits include "Locomotion", "Talking Loud and Clear" and "Sailing on the Seven Seas". They embarked on a comeback in 2010 with "History of Modern" and gained wider acclaim for the follow-up album "English Electric" in 2013. In 2017 they issued "The Punishment of Luxury".